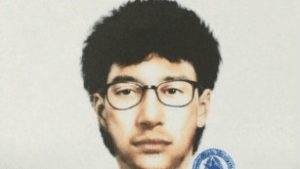 The hunt for the Bangkok bombers continues, with the authorities focusing on a male suspect caught on surveillance video dropping a backpack under a bench near the Erewan shrine and departing the area about fifteen minutes before the blast that killed 20 people and wounded over 120 others. He is the man in the yellow T-shirt referenced in earlier accounts of the incident, a person of interest from the first hours after the explosion. CNN quotes a Thai motorbike taxi driver who believes he unwittingly gave the suspect a ride away from the scene of the crime. “When I dropped him, he still appeared very calm, just like (a) normal customer. He seemed not in a hurry at all,” driver Kasem Pooksuwan told the network, after relating his story to the police. Although he could not be entirely certain, Kasem thought the individual probably was not Thai. He made a phone call during the taxi ride and was speaking a language the driver didn’t think was either Thai or English. “I wish I looked at his face more, but I really didn’t know what happened yet at that time. Normally I would not stare at my customer’s face,” he said. His forearms were reportedly wrapped in what might have been bandages, indicating a previous injury—perhaps from an accident while preparing the bombs or maybe the aftermath of a previous wrist-cutting suicide attempt? Or were they the sort of wrappings used in certain sports, such as Thai kickboxing? Prime Minister Prayuth Chan-o-cha made a public appeal to the mystery man to turn himself in, warning that his very life might depend on it, because his terrorist associates could decide to keep him quiet by killing him. 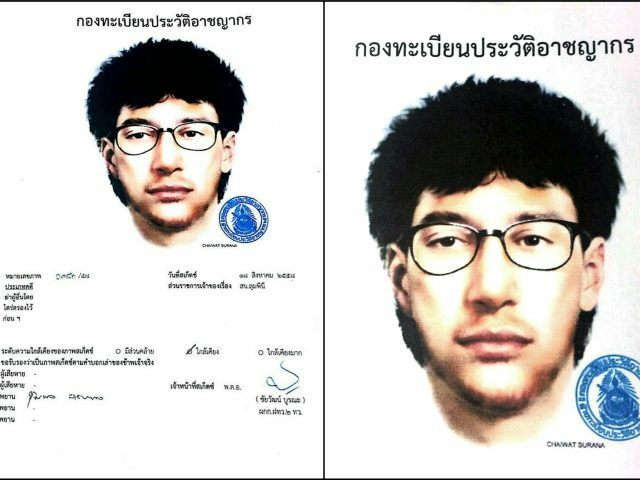 According to a BBC report, the police believe the suspect is still in Thailand. The search for possible accomplices continues as well; the BBC says there could be as many as ten of them. A woman in a black shirt was mentioned as a person of interest in the early hours of the investigation. According to another CNN report, the authorities would still like to speak with her. Meanwhile, two men sought by police because they appeared in the same surveillance video as the yellow-shirted man have turned themselves in to the authorities and were released after interrogation, having been identified as a tourist and tour guide who don’t appear to be connected with the attack. As for the bomb, it’s described as a “sophisticated” and evidently very powerful weapon, a pipe bomb stuffed with wheel bearings. The parts appear to be of local manufacture. The bomb unsuccessfully thrown at a pedestrian bridge after the shrine attack was of very similar construction. There have still been no claims of responsibility, and the authorities have only theories as to which terrorist group was behind the attack.